Arthur K. Wheelock Jr., “Emanuel de Witte/The Interior of the Oude Kerk, Amsterdam/c. 1660,” Dutch Paintings of the Seventeenth Century, NGA Online Editions, https://purl.org/nga/collection/artobject/130808 (accessed April 22, 2019). Emanuel de Witte and Pieter Saenredam (1597–1665) are the most important seventeenth-century painters of church interiors, a significant genre in Dutch art. The two artists nevertheless approached their subjects in radically different ways. Saenredam had a scientific, almost archaeological interest in a building's structure, as seen in his Cathedral of Saint John at 's-Hertogenbosch (1961.9.33). De Witte, on the other hand, employed figures and contrasts of light and shadow to establish the mood and to emphasize the spiritual function of the church. Most of De Witte’s churches can be identified as buildings that still dominate the cityscapes of Delft and Amsterdam, yet in his paintings he often combined architectural elements in imaginative and fanciful ways. The Interior of the Oude Kerk, Amsterdam is one of his most imposing works, not only because of its unusually large scale but also because of the impressive view it offers down the long nave. The painting is boldly executed, with dramatic light streaming across the composition. Numerous figures enliven the space, including a procession of soberly clad men who have entered the church at the far left to attend a funeral and the two gentlemen in the foreground who discuss the tomb from which the stone has just been lifted. In juxtaposition to the tomb, De Witte uses a beam of light to draw our attention to a mother nursing her child, thereby suggesting the cycle of life and death. De Witte was born in Alkmaar but trained with the still-life painter Evert van Aelst (1602–1657) in Delft. He began his career as a painter of biblical and mythological subjects (mostly night scenes). Around 1650 he started to specialize in architectural paintings of Delft churches. In 1652 he moved to Amsterdam, where he specialized in church interiors, but also painted market scenes and portraits. I would like to thank Molli Kuenstner for her extensive research on this painting. From the viewer’s low vantage point at the west end of the nave, the broad sweep of the church’s spacious interior is both imposing and inviting. Tall cylindrical columns flanking the nave, and three enormous brass chandeliers hanging from the wooden vaulted ceiling recede in rhythmic patterns to the distant choir. Bands of light stream dramatically across the dimly lit interior, illuminating the columns and the arches they support, the dark gray stone floor, and two groups of figures within the nave: a pair of elderly gentlemen who are engaged in an emphatic discussion before an open tomb in the foreground, and a young mother who sits on a wooden bench nursing her child. The church, dedicated to Saint Nicholas, was built on the foundations of a small, thirteenth-century, wooden chapel and cemetery. See H. Janse, De Oude Kerk te Amsterdam: Bouwgeschiedenis en restauratie (Zwolle, 2004), for the history of the construction of the Oude Kerk. Initially it was a Catholic church consisting of a central nave and two aisles. By the mid-sixteenth century, however, its appearance had been greatly transformed through the addition of a large choir, transepts that reached to the height of the central nave, and multiple chapels. In the late sixteenth century it became a Protestant church. At that time the thirty-eight altarpieces that once graced its interior were removed, and whitewash was applied to the walls and stone columns lining the nave and apse. The stained-glass windows, however, were retained, as was the decorative painting on the wooden vaulted ceiling. The dog had been painted out when the painting was illustrated in Ilse Manke, Emanuel de Witte, 1617–1692 (Amsterdam, 1963), no. 65. This theme has been discussed by, among others, Timothy Trent Blade, “Two Interior Views of the Old Church in Delft,” Museum Studies 6 (Art Institute of Chicago) (1971): 34–50; and Beverly Heisner, “Mortality and Faith: The Figural Motifs within Emanuel de Witte’s Dutch Church Interiors,” Studies in Iconography 6 (1980): 107–122. The interpretation of the mother nursing her child as a symbol of charity, as is sometimes found in the literature (see Timothy Trent Blade, “Two Interior Views,” 34–50), is not convincing, partially because of the context in which these figures appear, but partially also because Charity (caritas) traditionally is shown nursing two infants. The gravestone in De Witte’s painting is located at the site of the grave marked with the number 19 in the Oude Kerk. Finally, to purify and simplify his composition and to enhance the universality of his message, De Witte eliminated the banners, plaques, and heraldic shields that hung from the nave’s columns. He did not make this painting to commemorate a specific burial, but to comment upon the broader significance of this passage of life in Christian belief. The fact that De Witte oriented this grave in a north-south direction rather than on an east-west axis, as all graves in the church are actually oriented, reinforces the sense that his intention was not to depict an actual event, but rather to provide this scene with a broader allegorical statement about death. The stained-glass panel on this window indicated the names and family crests of Amsterdam burgomasters. 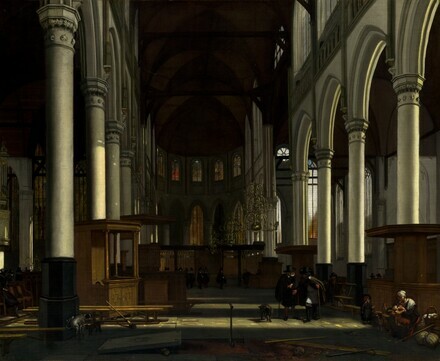 For an image of its probable appearance at this time, see De Witte’s Interior of the Oude Kerk, Amsterdam, with Townsfolk Gathered for a Service (fig. 1). Indeed, De Witte imaginatively controlled the lighting throughout the composition for dramatic effect. Light passing through the windows at the right, for example, strikes the arches on the south side of the nave in a consistent fashion, whereas only one column on the north side of the nave is brightly illuminated. (Sale, Philippus van der Schley et al. at Arnoldus Dankmeyer & Son, Amsterdam, 14-15 August 1793, no. 215); Fouquet, Amsterdam; (sale, Philippus van der Schley et al. at Huis van Trip, Amsterdam, 7-8 May 1804, no. 194). E.W. Walker; (sale, Christie, Manson & Woods, London, 10 April 1883, no. 123); Lesser. John Femor-Hesketh, Towcaster, Northamptonshire. (Mortimer Brandt, New York), by 1951/1952 until at least 1963. (Noortman & Brod, New York), by 1981. Saul P. and Gayfryd Steinberg, New York; (sale, Christie, Manson & Woods, New York, 12 January 1996, no. 197); private collection, New York; purchased 17 November 2004 through (Gurr-Johns, London) by NGA. E.W. Walker is the vendor's name originally written under stock number 332R in Christie's daybook for the 1883 sale, but it is crossed out and "Miss Maples" is written above it, so it is not certain who the seller was. This information was kindly supplied by Marijke Booth of Christie's Archives Department (e-mail of 13 December 2005, in NGA curatorial files). The name of the buyer, originally given to the NGA as "Legge," was kindly corrected by Marijke Booth of Christie's Archives Department (e-mail of 8 December 2005, in NGA curatorial files). Inaugural Exhibition of Fine Paintings and Drawings, Noortman & Brod, New York, 1981, no. 15, repro. The support is a coarse, open-weave fabric that has been lined. The tacking margins are no longer extant, but cusping is present on all four sides of the painting, indicating that it probably retains its original dimensions. The fabric was prepared with a double ground. The lower layer is red and the top layer is dark gray, both are rather thick. Infrared reflectography at 1.5 – 1.7 microns revealed some preliminary drawing in the architectural elements. De Witte carefully layered his brushstrokes to allow the lower layers to show through the upper ones. The painting has some small losses and minor abrasion, but overall it is in good condition. The fine overall crackle pattern is most visible in the white columns. The crackle in this area has been minimized with inpainting. The gold at the ends of the vaulted ceiling ribs may be restoration. Infrared reflectography was performed using a FLIR Indigo/Alpha VisGaAs camera. Houbraken, Arnold. De Groote Schouburgh der Nederlantsche Konstschilders en Schilderessen. 3 vols. in 1. (Facsimile edition, Amsterdam, 1976). The Hague, 1753: 1:283. Manke, Ilse. Emanuel de Witte, 1617-1692. Amsterdam, 1963: 93, no. 65, pl. 46. Noortman & Brod Ltd. Inaugural exhibition of fine paintings and drawings. Exh. cat. Noortman & Brod Ltd, New York, 1981: unpaginated, no. 15, repro. Liedtke, Walter A. Architectural painting in Delft: Gerard Houckgeest, Hendrick van Vliet, Emanuel de Witte. Doornspijk, 1982: 125-126, pl. IX. Lopez, Janet Ruth Gardner. "The Church Interiors of Emanuel de Witte." M.A. thesis, University of Delaware, 1987: 26-29, fig. 18. Sontag, Susan. "The Pleasure of the Image." Art in America 75, no. 11 (November 1987): 126, repro. 127. "Gifts and Acquisitions." National Gallery of Art Bulletin no. 33 (Summer 2005): 18, repro. Masello, David. "100 Top Treasures." Art and Antiques 28, no. 11 (November 2005): 93, fig. 64. Richard, Paul. "From the Collection. Washington's Prize Possessions." The Washington Post (July 17, 2005): N5, repro. Wheelock, Arthur K., Jr. "Emanuel de Witte: 'The Interior of the Oude Kerk, Amsterdam.'" National Gallery of Art Bulletin, no. 33 (2005): 18, repro. I would like to thank Molli Kuenstner for her extensive research on this painting. The church, dedicated to Saint Nicholas, was built on the foundations of a small, thirteenth-century, wooden chapel and cemetery. See H. Janse, De Oude Kerk te Amsterdam: Bouwgeschiedenis en restauratie (Zwolle, 2004), for the history of the construction of the Oude Kerk. De Witte included many of the same elements (the nursing mother, the open tomb, and the funeral procession) in his Oude Kerk in Amsterdam, c. 1655, oil on panel, Musée des Beaux Arts, Strasbourg. See Ilse Manke, Emanuel de Witte, 1617–1692 (Amsterdam, 1963), no. 66. The gravestone in De Witte’s painting is located at the site of the grave marked with the number 19 in the Oude Kerk. For these paintings, see Ilse Manke, Emanuel de Witte, 1617–1692 (Amsterdam, 1963). For an analysis of the subjects of these apse windows, which were donated to the Oude Kerk by King Philip II of Spain, see Wim de Groot, “Bloei en teloorgang van de Bourgondisch-Habsburgse glazen in de Oude Kerk van Amsterdam,” Amstelodamum: Maandblad voor de kennis van Amsterdam 92, no. 6 (November–December 2005): 17–32. The stained-glass panel on this window indicated the names and family crests of Amsterdam burgomasters. For an image of its probable appearance at this time, see De Witte’s Interior of the Oude Kerk, Amsterdam, with Townsfolk Gathered for a Service (fig. 1).